My cheeks hurt from smiling. Truth is, I stayed up all night reading it. For sweet romance lovers with a little humor on the side this is the book for you. Giveaway Details $25 Amazon Gift Card or Paypal Cash Giveaway Ends 3/26/19 Open only to those who can legally enter, receive and use an Amazon.com Gift Code or Paypal Cash. Winning Entry will be verified prior to prize being awarded. No purchase necessary. You must be 18 or older to enter or have your parent enter for you. The winner will be chosen by rafflecopter and announced here as well as emailed and will have 48 hours to respond or a new winner will be chosen. This giveaway is in no way associated with Facebook, Twitter, Rafflecopter or any other entity unless otherwise specified. The number of eligible entries received determines the odds of winning. This giveaway was organized by Kathy from Clean Wholesome Romance and sponsored by the author. VOID WHERE PROHIBITED BY LAW. Welcome to Middleton Prep, a place where fairy tales and modern day collide. Where fair maidens spend their time developing lesson plans and valiant knights do battle with unreliable wifi signals; all in the hopes of finding True Love. Librarian Piper Belmont’s world turns topsy turvy when new football coach Nash Wilde joins the staff at her school. Tall, dark and handsome, he’s every girl’s dream...until Piper realizes he only speaks in grunts and nods. Determined not to judge a book by its cover, Piper agrees to go out with him. Just as they are getting to know each other, a family emergency forces Piper to leave town. Will she ever get the chance learn the secrets behind Nash’s silence? Or will the staff’s reigning beauty queen catch Nash’s interest before Piper gets back? 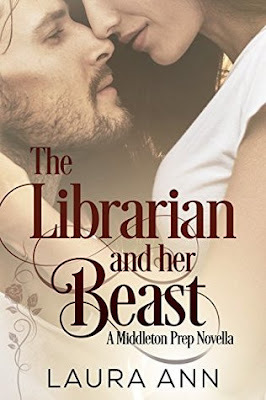 The Librarian and Her Beast is the first book in the Middleton Prep series. Each book is a stand alone story, but the series is best read in order. Every installment is a loosely based, contemporary retelling of a favorite fairy tale, full of swoon worthy kisses and, of course, a Happily Ever After. I enjoyed this cute novella with a fun premise- classic fairy tale characters are modern day teachers and staff at a high school. This story is obviously based on Beauty and the Beast, and I thought it was a nice nod to make Piper the librarian. She's likeable and has some funny quirks. Nash represents the Beast as a nearly mute math teacher and football coach (although his brawniness comes off as hot rather than fearsome). The mystery of why he wouldn't talk kept me reading and while I thought Piper was enabling him by "playing a one-sided game of twenty questions," it drew out the relationship until other conflicts enter the plot to mix things up. They have great physical chemistry in the beginning of their relationship, and over time they learn to read each other and grow closer in other ways. The villain was way over the top which was a turn-off since I prefer more subtlety and dimensionality. Overall it was a fun bit of fluff that provided a nice escape for an evening.